"Craving the Kogi® Truck and can't drive out to get a bulgogi burrito? 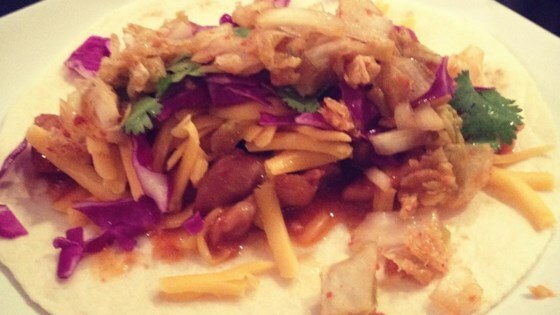 Recipe was created out of a sudden craving for the Kogi® Truck in Los Angeles. To avoid a soggy burrito, be sure to squeeze out any liquids from the kimchi." Preheat oven to 360 degrees F (182 degrees C). Stir garlic, chile paste, soy sauce, sugar, and sesame oil together in a bowl until the sugar dissolves into the liquid; add chicken and stir to coat. Wrap tortillas in aluminum foil and bake in preheated oven until hot and soft, about 10 minutes. While the tortillas warm, heat vegetable oil in a skillet. Cook and stir chicken in skillet until hot and the sauce has thickened, about 10 minutes. Spread 1/2 teaspoon butter over one side of each warm tortilla. Divide chicken between the tortillas. Top chicken with equal portions of the cilantro, kimchi, Cheddar cheese, and salsa. Fold opposing ends of each tortilla toward one another to partially cover the filling. Pull one remaining edge over the filling and then roll so the tortilla surrounds the filling completely. See how to make tender, extra-crispy, double-fried Korean chicken. This was delicious only changes I made was I used fresh chicken cause canned is yucky and doubled sauce since I cooked chicken in it! Otherwise this was amazing!